Blogging by Solveig Haugland, author of the OpenOffice.org Guidebook and owner of GetOpenOffice.org. Tips for using, transitioning, and more. I talked in this post about how to use regular expressions in filters. The key point is that where you would use * in Excel, you use . * in Calc. Filters aren't the only place where regular expressions come up. 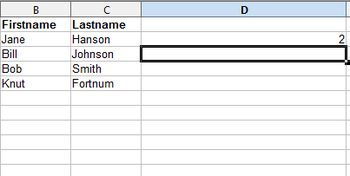 Let's say you want to count the number of people whose last name ends in "son" in a big list of names, range C5:C300. You can use COUNTIF. Here's an example. First you have the range, then the text you want to find in the range. The result is the number of time that text was found in the range. Now, the reason that the correct result is shown is that I have this option marked under Tools > Options > OpenOffice.org Calc > Calculate. It's pretty straightforward: "Enable Regular Expressions in Formulas." If I unmark that option and click OK, then I get 0 as my result. So if you do regular expressions in formulas, keep it marked. 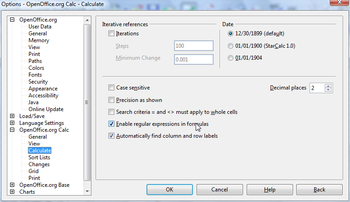 Note: I've also been told that you should deselect Search Criteria = and <> Must Apply to the Whole Cell but I haven't noticed an effect one way or the other. Here's some additional guidance for using regular expressions. Syntax examples for COUNTIF(), counting cells that meet the specified criteria in the range B2:B35. Use the same symbols for other functions that allow regular expressions. Note: There aren't any handy dropdown lists in Filter windows so that you can select "Contains" or "Starts with". You need to type out the syntax. However, the following table should help. Thanks! I'd somehow managed to miss the COUNTIF function. I just replaced a few ridiculously complex formulas with simple COUNTIF functions using basic regular expressions. Great! This blog is really useful. Is is possible to use regexp in the IF-function as well? Any tips would surely be appreciated. is the filter function able to filter and show the rows which contain certain word? In excel, this could be done by using "contain", however when i try to do the same thing in calc, it seems doesnt work. pls advise. just put . * before and after what you want. THANK YOU!! I am used to Excel (and the * wildcard), and have been going NUTS on this one, so simple, it's no longer *, it is .*!!! You saved me!! How would I proceed if I wanted to count the words in a single cell using Calc? Thank you very much for posting this, and other blog entries. I was having trouble using the filter feature of Data Pilot tables in Calc (I'm trying to take a set of results and filter out those having the string "SSE" in them), and this blog entry told me exactly what I needed to know (use ".*SSE. *" instead of "*SSE*", as Excel would have me do).